Welcome to The Billy’s (Malawi Project) Website. 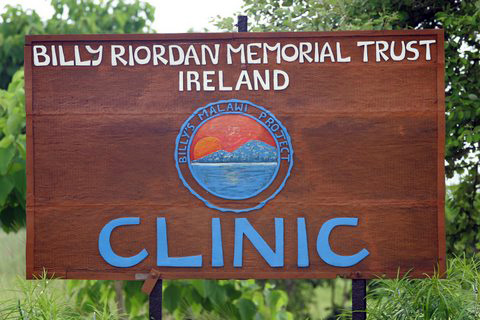 The original Billy Riordan Memorial Clinic was opened in 2004 to provide primary care medical services to the people of Chembe and Cape Maclear in Malawi in Central Africa. At the time there was no medical treatment available in the community of approximately 16,000 people. Men, women and children died on a daily basis from largely preventable and treatable diseases. The nearest district hospital is a one and a half hour difficult journey away and was out of reach for most villagers. Today The Billy Clinic remains the only medical care available in the area. In 2007 a small in-patient unit was added and the clinic now provides 24 hour medical care on an in-patient and out-patient basis to the largely subsistence farming population. During the dry season an average of 80 patients attend the clinic every day but this can rise to 120 during the wet season. The conditions most frequently seen are HIV/Aids and Malaria and associated diseases such as asthma, dysentery and malnutrition. The Clinic is staffed mainly on a volunteer basis and is constantly seeking new volunteers. All our funding comes from donations of which 91% goes directly to the running costs of the clinic. If you could give 4/5 months volunteer service to the clinic, we would love to hear from you.